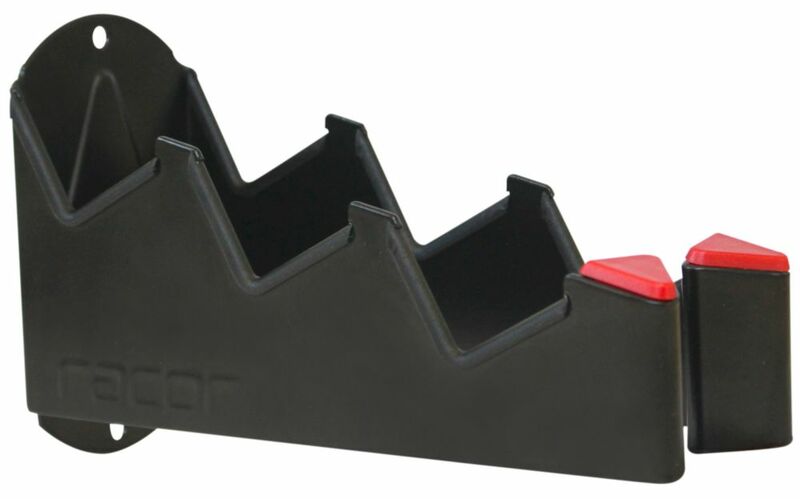 The Racor SecureHold Triple Tool Holder mounts to the wall and creates a place to store frequent and seasonally used long handled tools such as shovels, rakes, brooms, other garden tools, and even heavy items like string trimmings and lawn edgers. The holder accommodates three long handled tools and safely and securely stores them. The holder is 35% stronger than the leading hooks providing superior strength. The spring opening and deep v-groove helps keep tools from accidently falling. Providing safety and strength, this is safer storage, protecting children, cars, and valuables. Securehold Triple Hook The Racor SecureHold Triple Tool Holder mounts to the wall and creates a place to store frequent and seasonally used long handled tools such as shovels, rakes, brooms, other garden tools, and even heavy items like string trimmings and lawn edgers. The holder accommodates three long handled tools and safely and securely stores them. The holder is 35% stronger than the leading hooks providing superior strength. The spring opening and deep v-groove helps keep tools from accidently falling. Providing safety and strength, this is safer storage, protecting children, cars, and valuables. Securehold Triple Hook is rated 4.3 out of 5 by 10. Rated 5 out of 5 by HomeDepotCustomer from Very easy to install and works very well. Appearance is... Very easy to install and works very well. Appearance is very neat and clean . Rated 4 out of 5 by BobbyD from holds my three axes very nicely.. very easy to install,... holds my three axes very nicely.. very easy to install, just centered it on stuff in shed.. Rated 5 out of 5 by Pops from Easy install, holds tools. What else is there to say?... Easy install, holds tools. What else is there to say? Rated 5 out of 5 by HomeDepotCustomer from Simple and effective at holding my axes.... Simple and effective at holding my axes. Rated 4 out of 5 by Tometeaser from Some time ago, I purchased three of these. Finding time to clean up the garage - I figured out I ... Some time ago, I purchased three of these. Finding time to clean up the garage - I figured out I could use a few more. These work pretty well, for hanging tools, Not all hanging tools fit nicely into the slots, but most do. I also hung my tank sprayers off the end. Its feels great to better organized these brooms, garden tools, etc and get them off the floor. Rated 5 out of 5 by Nate from Does what it's supposed to do. I bought two of... Does what it's supposed to do. I bought two of these and went straight into the studs with them. One of them is holding a sledgehammer, an axe, and a garden spade; which means they can definitely support plenty of weight.